We’re on a finish-surface frenzy over at Bob’s house, using all kinds of wood. 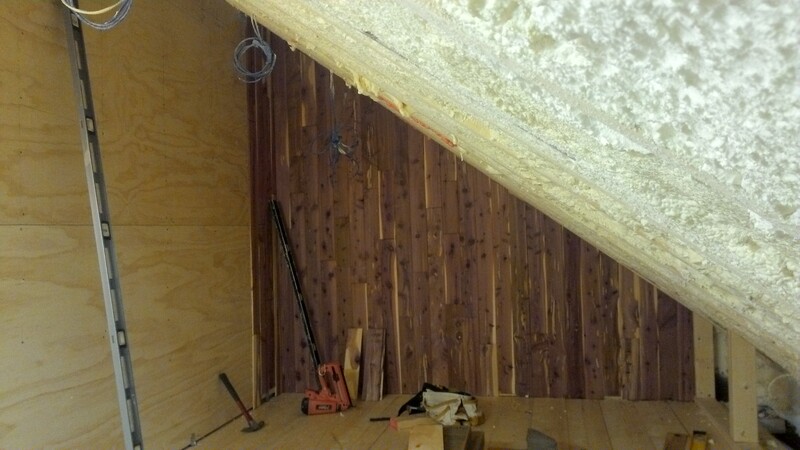 The living room floor is totally in place, while upstairs, several gorgeous rustic walls are underway. The new living room floor. It took a considerable effort from Hans and Mark to complete the living room floor. The oak floorboards are super skinny, just 2 inches wide, which means the 15-foot-wide room needed about 90 rows of the stuff. Adding frustration, coming out of the package, roughly one in three floorboards proved unusable. 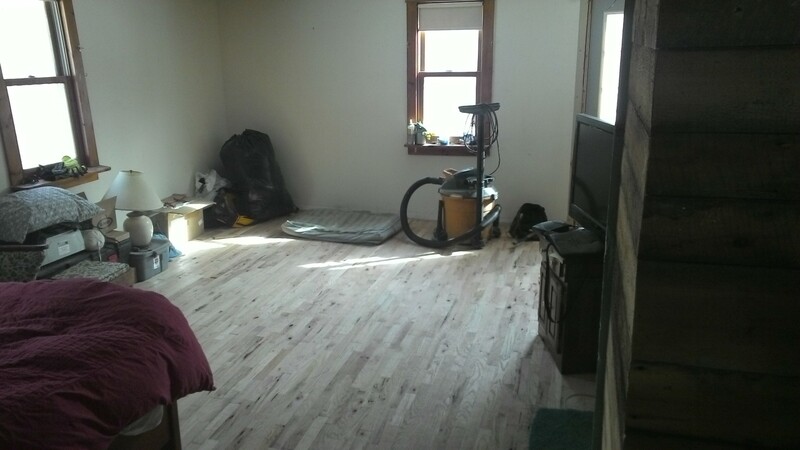 And since the home is occupied throughout the construction (by Bob, Suze, and their three dogs), the living room contains a bunch of furniture, which had to do-si-do around the room as the flooring progressed. It’s all tongue-and-grooved in place now, but still needs a good sanding to look finished. I’m most excited about the master closet, which we’re cladding in cedar – one of the best-smelling woods and also one of the prettiest. Our planks come in four-foot lengths with teeny-tiny tongues and grooves. They fit together readily when they’re straight, but (there’s always a but) hardly any of them are straight. When they wobble along the weak axis we can force them out during installation. Bends around the strong axis, though, are hopeless. “Good for boat building,” says Mark wryly about the C shaped ones. We’ll try to return them to the lumber yard. One closet wall finished in cedar. So far Hans has done most of the cutting and I’ve done most of the nailing in place, using a finish nail gun. I install the cedar vertically, staggering joints as pattern-free as possible, constantly using a level to check plumbness. I also have to make sure I don’t nail into any electrical cables, which are hidden behind the plywood. It’s slow, methodical work. Finally, Mark repurposed some old subfloor we pulled up last month to clad the upstairs bathroom wall. I have no clue what kind of wood this is. It’s old. 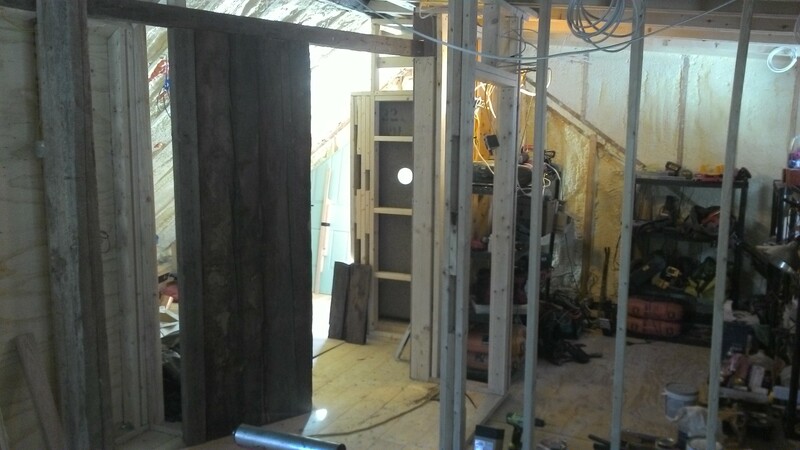 Barnboard clads the bathroom wall at the top of the stairs.